A single infusion mash was done at 158F, and I pulled off 1/2 gallon as stated above 15 minutes in. I also batch sparged with 175F water, to try to wash out as much of the starch and get some of the tannins from the grain. I stirred this up quite a bit, and sparged quickly, so the wort was very cloudy, which is what I was looking for. 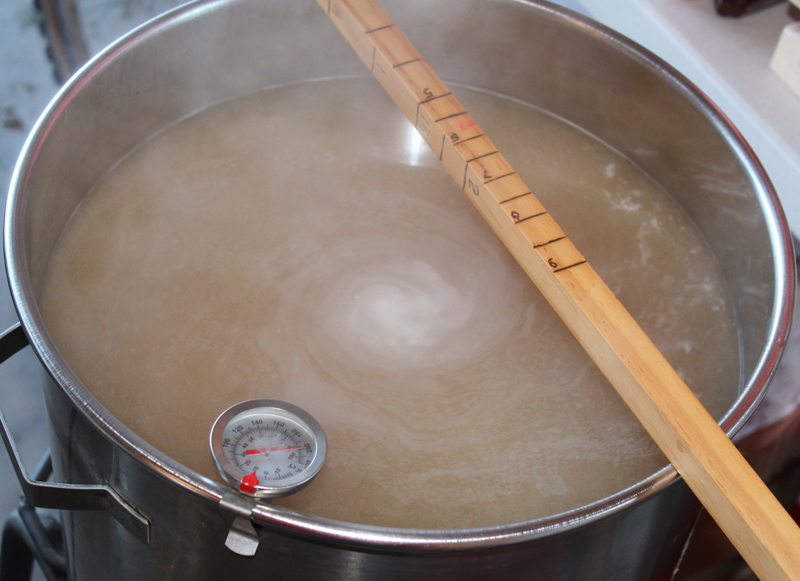 The maltodextrine and the hops were added at the start of the boil. I ended up with 5.25 gallons with an OG of 1.050. I cooled it off, and pitched in some slurry from Lambic #2. It is already starting to ferment at less then 24 hours, so I doubt I will add any fresh saccharomyces to the mix. How did #lambic 3 turn out with the flaked wheat process compared to #2 mini mash adjunct? Honestly, I have not gotten to bottling it off. I have so much else going on right now, I just have not been able to get to it. I will say that I have tasted hydrometer samples, and it was down to 1.005 in about 6 months. It is intensely sour, likely from the culture more than anything else. I have repitched this lambic blend several times, and it is becoming a bit unbalanced. I will likely use some fresh yeast for the next batch, and add some of this culture about a week into it next time to tame that. I also need to brew a clean beer to blend this back. I have been eyeing some saisons that I want to brew in the near future, and I think about 1 gallon of this mixed in a keg with some fresh saison maybe a great beer for the summertime.